This quote on the cover of the book had my heart. You can’t blend in when you are born to stand out. I am very happy with my choices when it came to books this year. DH often asks me how I decide on picking a book to read – well, there are multiple sources - but one that never fails me are the books that come recommended from some of my favourite bloggers. 'Wonder' came highly recommended by Shailaja and I knew I could blindly trust her words for it. Meet 10-year-old August Pullman aka Auggie. He loves doing everything a normal kid of his age loves to do – riding a bicycle, eating ice-cream and playing video games. But, Auggie is anything but normal as he suffers from a rare genetic craniofacial deformity which makes him stand out in a crowd. Despite all the surgeries he has had till date, he doesn’t even come close to looking normal. He lives with his parents and his sister Olivia and has been homeschooled through fourth grade. His parents now think that it is time for him to go to a mainstream school for fifth grade. Auggie is terrified at the idea because he knows that he cannot walk down the school corridor without getting his fair share of stares. But he also knows that it is for his own good and he has to step out and face the brutal world. 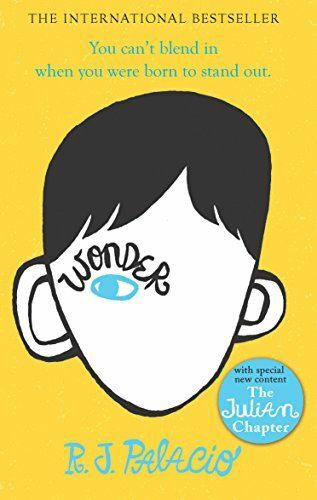 The story in Wonder pivots around Auggie’s first year at Beecher Prep School. The story is narrated from multiple points of views. Of course, the main voice is Auggie’s but a large part of it is also told from the point of view of other characters which includes Auggie’s sister Olivia, two of his school friends, Olivia’s boyfriend, Olivia’s friend Miranda. Each narrator adds a new layer and another dimension to the story and makes everything come alive in front of your eyes. The book is poignant, warm, hopeful, and funny. It teaches us quite a lot and the good thing is that it does so without being preachy. The underlying theme throughout the book is ‘kindness’. It also dwells on family bonding and love, friendship, empathy, and loyalty. Every character is sketched with care and shines in its own space. Auggie’s parents, Olivia, Jack, Summer, Justin, Mr Brown – the English teacher, Mr Tushman – the principal- everyone has something to offer in the story. The speech by Mr Tushman at the end had me in tears. Although the way the book ended seemed little clichéd, I know I wouldn’t have liked it any other way. Take my words for it – this book is worth every bit of the praise it is receiving. There are certain lines from the book that sums up the essence of the book. 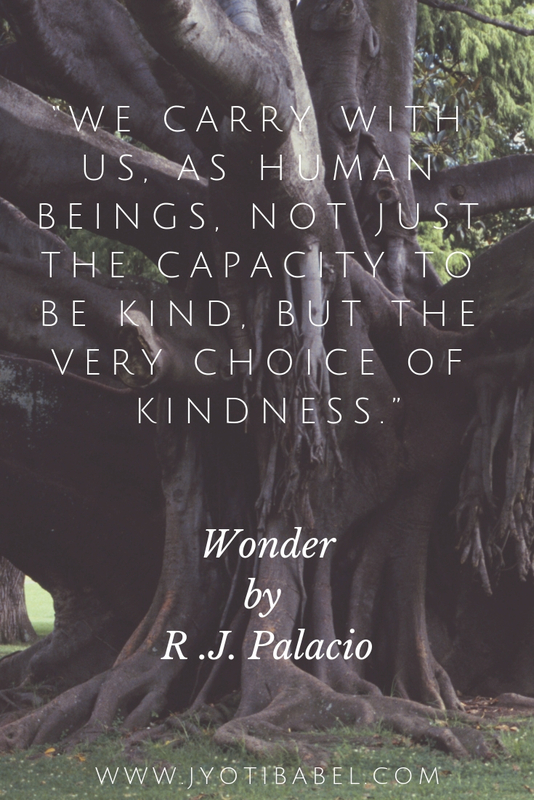 Wonder by R.J.Palacio is a wonderful book – one that can make the readers laugh and cry in the same breath. It deserves to be read. This book has also been adapted into a movie (already in my to-watch list), so if you are not into reading books, go watch the movie.